Caftan Woman: Broadway to Hollywood: Chaney, Huston and "Kongo"
Broadway to Hollywood: Chaney, Huston and "Kongo"
It's been quite a while since this blog has looked at the twists and turns of casting from Broadway to Hollywood. A recent screening on TCM of Tod Browning's 1928 thriller West of Zanzibar prompted this look at a two extraordinary actors. 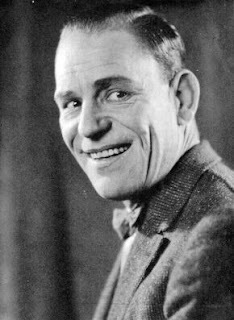 Lon Chaney, "The Man of a Thousand Faces", made only one sound picture before his untimely death from lung cancer at the age of 47 and that was a remake of 1925s The Unholy Three. Yet such is the power of his performances that long before I saw the 1930 movie I was convinced I had heard Chaney speak. In role after role, from The Phantom of the Opera to The Hunchback of Notre Dame, from He Who Gets Slapped to Laugh, Clown, Laugh Lon Chaney possessed the talent and the skill to transcend the screen and make the audience feel and know his inner being. Chaney early learned to communicate with his deaf parents and was born an instinctive entertainer. A vaudevillian who could sing, dance and make people laugh, today Chaney is recalled mainly for characterizations in the horror genre. Yet, he said ,"I hope I shall never be accused of striving merely for horrible effects." Lon Chaney's talents as an actor and as a make-up artist created characters that showed us many horrors and much nobility. 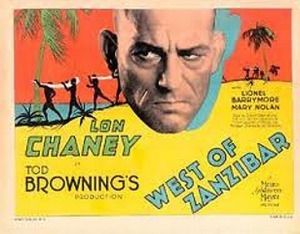 One of the 10 films Lon Chaney made with director Tod Browning is West of Zanzibar. It is a tale of revenge and redemption. As Phroso aka Dead Legs, he rules a territory in Africa by confounding superstitious natives with magic and fear. Phroso lives for one thing, to take revenge on the man who made him a cripple and stole his wife and daughter. The girl is the victim of abuse which is the core of the vengeance and the victim of a cruel twist of fate which tears the soul out of her tormentor. The audience is in the hands of the master watching Lon Chaney in West of Zanzibar. Canadian born Walter Huston was enjoying success on the Broadway stage while Lon Chaney was wowing them in movies in the 1920s. 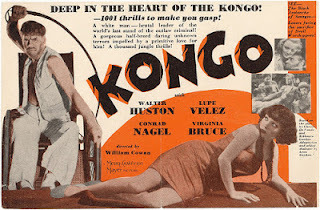 One of those plays was Kongo written and directed by Chester De Vonde and Kilbourn Gordon. The play ran for 135 performances in 1926 and became the 1928 movie West of Zanzibar. How often has the stage star looked west to see someone else take over "their" role? In 1929 Huston himself headed west and began his distinguished film career. Early on he appeared in such diverse roles as the villain Trampas in The Virginian, as Abraham Lincoln in that titled picture for D.W. Griffith and as a sympathetic prison warden in The Criminal Code for Howard Hawks. In 1932 Huston was outstanding in Frank Capra's American Madness, as the hypocritical Davidson in Rain and as Flint, the hate-filled cripple in Kongo in the sound remake of West of Zanzibar, going back to the original title. If it is possible, the lurid story seems even more so in sound. Huston is never less than riveting and no matter how much you want to turn away, you cannot ignore the depths to which this man fell and the overwhelming remorse he experiences. In a fortunate case of not messing with success, when Walter Huston's 1934 stage success Dodsworth was beautifully filmed by William Wyler in 1936 it starred Huston who received a well-deserved Oscar nomination. However, he would have to wait until 1948s The Treasure of the Sierra Madre for the statue in the supporting category. Two admirable actors and one despicable role in the winding road from Broadway to Hollywood. I loved DODSWORTH, it's one of my all time favorite films. I even loved the book which I read only last year. Walter Huston was splendid and I even liked Mary Astor, not always my favorite actress. I've never seen a Lon Chaney film (only his son in the Wolfman pictures). Wow, dead at 47. That's brief. But he packed a lot into those years. Isn't it funny how men of that era often looked older than their years? Think it could have had something to do with all the smoking? I love this: "...such is the power of his performances that long before I saw the 1930 version I was convinced I had heard Chaney speak." Two great actors, and though I've not seen these films, I can easily see your point. I love Lon Chaney. I also like nods to the stage and its contribution to film. Yvette, I find that lately I look to the novels that were turned into favourite movies for my "what to read next" list. And I surprise myself with the books I have been neglecting. For shame! Ruth Chatterton's role of Fran Dodsworth was played on Broadway by Fay Bainter. Something to think of the next time we see Bainter in a film. I do hope you get to see Chaney in one of his signature roles soon. The man really is as good as advertised. Smoking was indeed the culprit in Lon Senior's brief life. So sad. "West of Zanzibar" and "Kongo" must be seen to be believed. TCM gave Lon the Summer Under the Stars treatment last year, but I don't know if he has ever been accorded Star of the Month status. The man deserves more primetime showings. Although I haven't seen West of Zanzibar or Kongo, I really like your take in this piece, connecting two great actors together through these roles. The next time the movies come around in the TCM cycle they'll be worth a peek. I am one of those sad movie lovers that only say Chaney in his horror movies. You have convinced me to make a extra effort to find some of his other movies. Oh, yes...I love Walter Huston and wish more of his films were readily available. Thanks again. Aha! When you're done with the AFI (or vice versa) you must to on a Chaney quest. 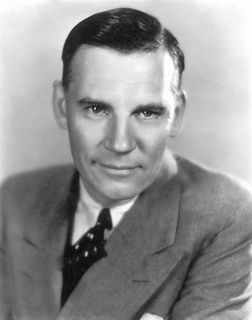 Hey - I didn`t know Walter Huston was Canadian?! I absolutely love him in everything - Lon Chaney, too, although I am less familiar with his work. A few years ago I read that Walter Huston had a sister still living in Stratford, Ontario. I imagine she's gone now, but it's amazing how many classic era actors started out north of the border.